The fast opening and closing speed improves your traffic flow, provides employee comfort, and saves energy. It protects your environment against draught, humidity, dust and dirt. An exceptional reliability and smooth operation is ensured by a motor driven by a frequency inverter. This technology ensures a soft start and stop. 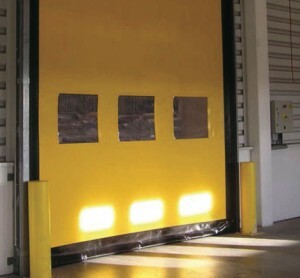 Albany high speed doors are equipped with a break- away – and automatic repair system. The curtain reintroduces itself after a crash to reduce downtime and maintenance. Features that make our doors completely safe. – The soft bottom edge has no rigid parts, it moulds around any obstruction to prevent injury or damage. – When an object hits the door, the fabric curtain absorbs the impact and releases itself from its side guides without causing damage or being damaged itself. To increase the admission of daylight and visibility, the door curtain can be equipped with windows or vision panels. Windows have fixed sizes and are located on a pre-defined grid. The fast opening and closing speed improves your traffic flow, provides employee comfort, and saves energy. The unique direct door drive system eliminates the need for weighted bottom bars or tension systems by actively driving the door curtain. An exceptional reliability and smooth operation is ensured by a frequency inverter driven motor for a soft start and stop. – Thesoftbottomedgehasnorigidparts,itmoulds around any obstruction to prevent injury or damage. – Whenanobjecthitsthedoor,thefabriccurtain absorbs the impact and releases itself from its side guides without causing damage or being damaged itself. 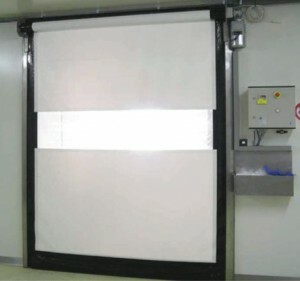 To increase the admission of daylight and visibility, the door curtain can be equipped with windows or vision panels. Windows have fixed sizes in a grid. A vision panel uses the full width of the door curtain. An insulated curtain with an increased static insulation of 2,41 W/ (m2K) is available as an option.